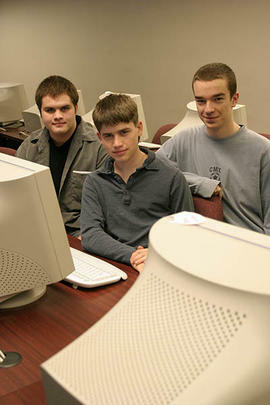 Photograph of students who won a competition, posing together in a computer lab in April, 2006. 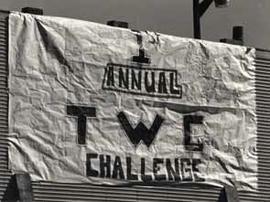 Photograph of students involved in a pie-eating contest. Photograph of students posing on the lawn next to the Mattson Centre, holding up the banana trophy they've just won in The Challenge. Photograph of women's dormitory members 3F and North Upper and men's dormitory members 9 and 10 Upper and Lower, all winners in the The Challenge, posing together outside. Photograph of the senior women posing together after winning an event in The Challenge; Diane Denney is front and centre, Liz Wilson is on the top.